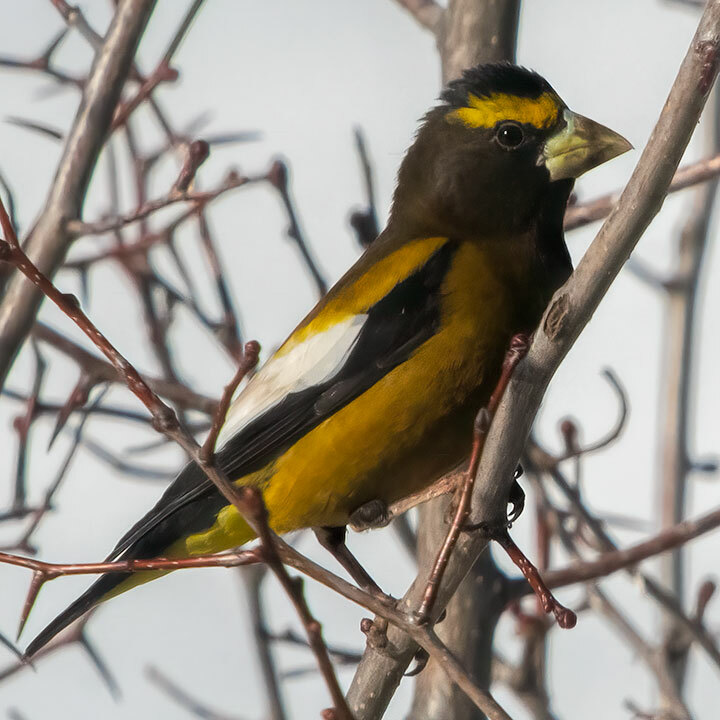 The name given this bird by nineteenth-century settlers, Evening Grosbeak, comes from the mistaken belief that it only came out to sing after sundown. Much better is its name in French, le gros-bec errant, for it truly is the wandering grosbeak. Both languages agree on its prodigious beak. 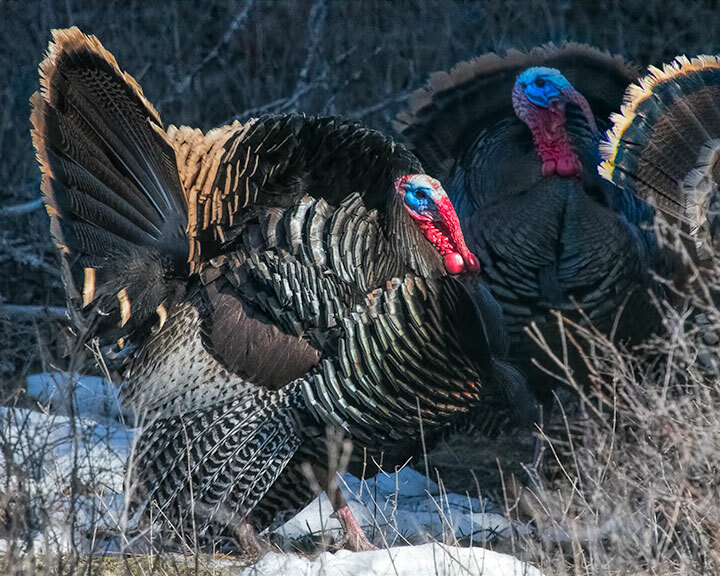 It might be seen around here at any time of the year, but only occasionally, for it wanders widely in its search for food. Although seen by others over recent decades, I last saw one eight years ago. Last weekend, I watched a small group of them in some black hawthorn bushes — a plant that in some seasons provides them with berries. 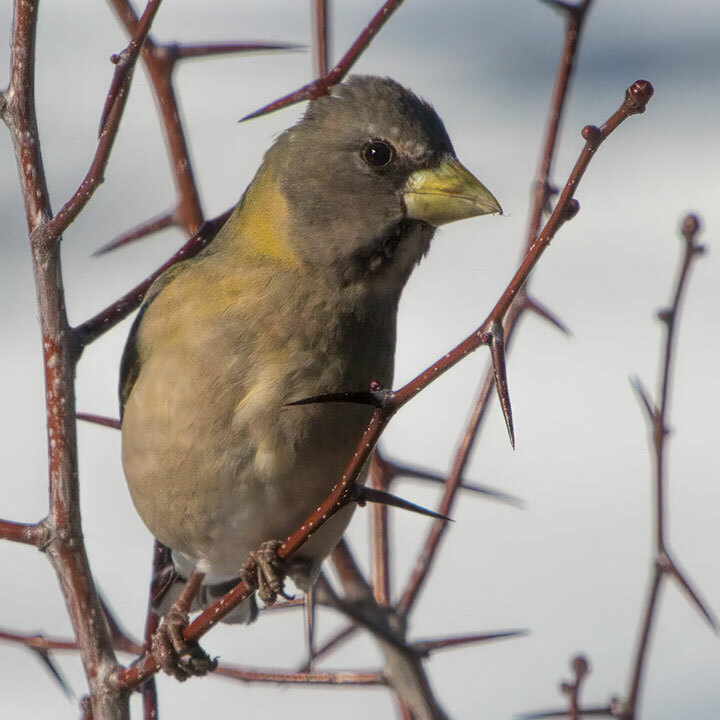 A female Evening Grosbeak has a subdued colouration of smoky grey with touches of yellow. The male Evening Grosbeak is much more stridently coloured. Now and then, I am reminded that I am only able to glimpse at the lives of the wildlife around me. 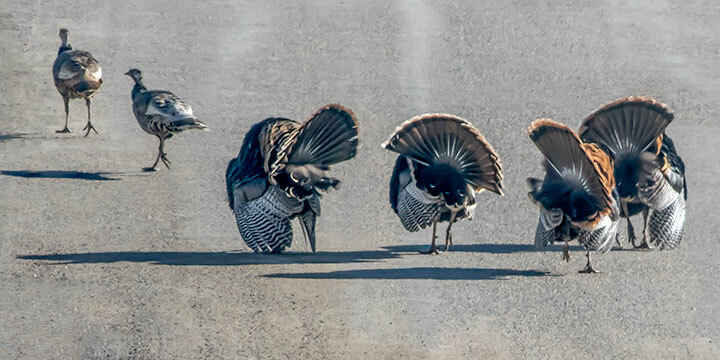 I see feeding, and furtive attempts to cross a road, but that is about it. However, occasional clues as to the tumultuous lives of deer can be seen. A couple of them were seen a few days ago, but I start with two older observations. 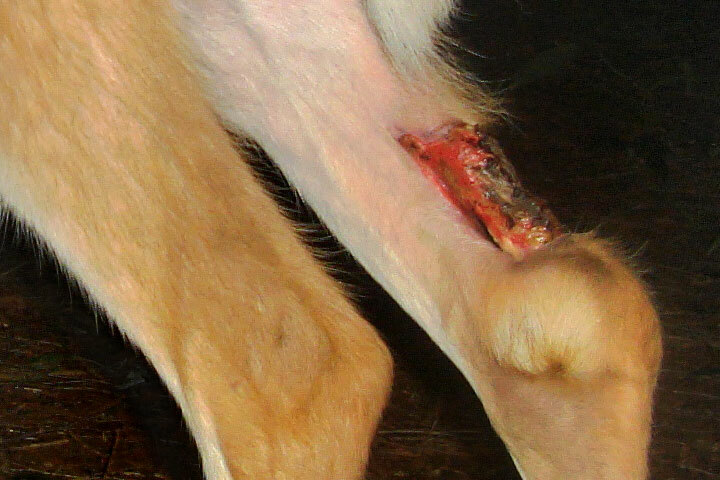 Here is a 2006 shot of a lesion on the leg of a white-tailed deer. I suspect that it records a recent coyote attack — but, who knows? The deer clearly escaped. Then there is a partial skeleton in the snow seen in 2009. 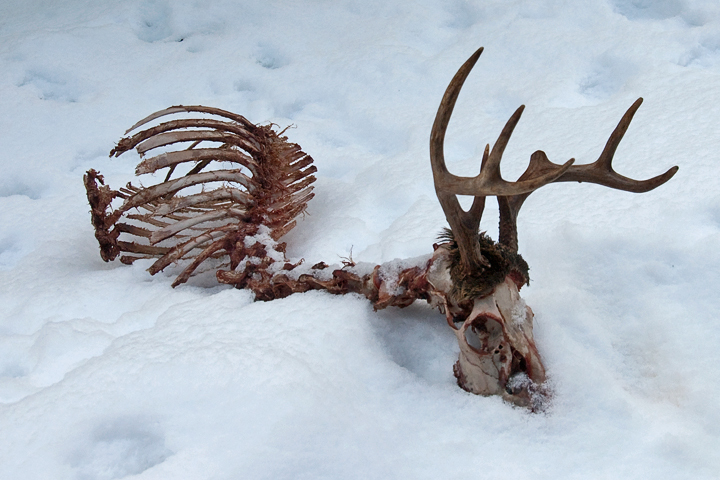 The deer was probably feasted on by a coyote and finished off by ravens. These early observations were widely spaced. So, it was unexpected to see two more in one day. 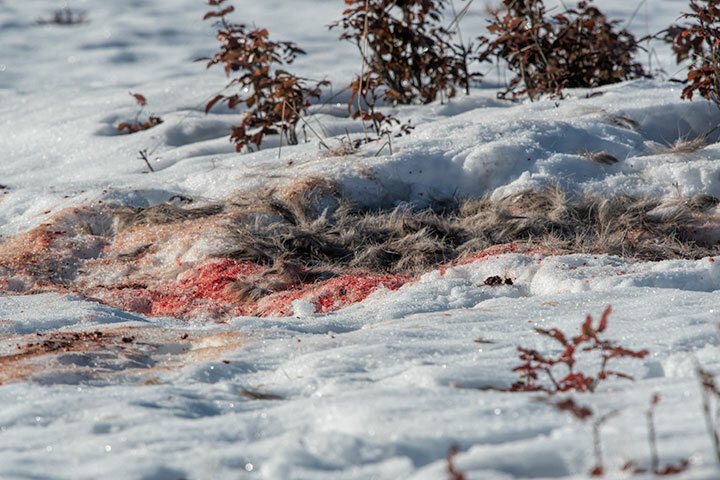 All that remains in the snow is blood and fur. 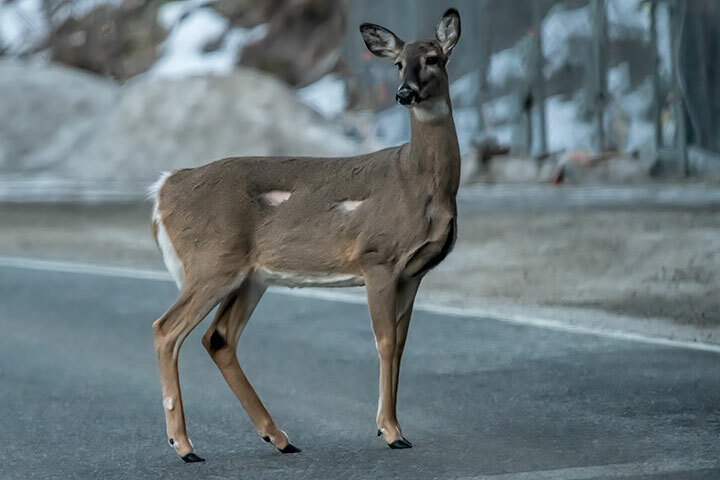 Finally, there was another survivor, a male white-tailed deer (note the pedicle scars), which was crossing the highway in the pre-dawn light. It bore evidence of two prominent lacerations on its side, the size and placement of which suggest the claws of a cougar. Winter is losing its grip. Valley snow is vanishing and the trees are alive with twittering. 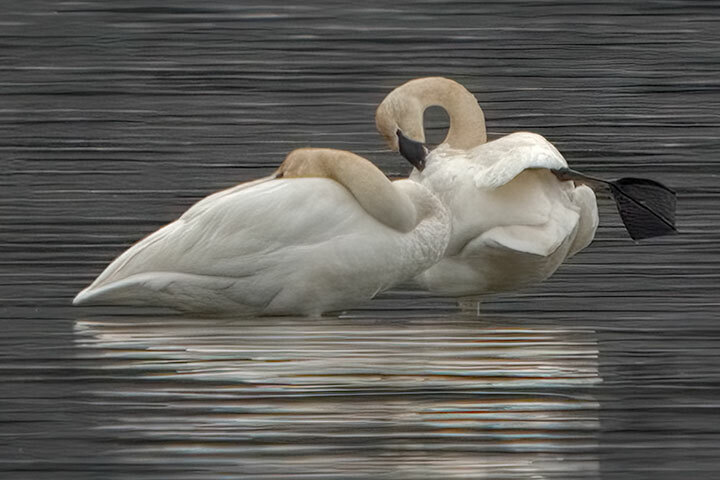 Trumpeter Swans and Bohemian Waxwings have flown north to their breeding grounds. 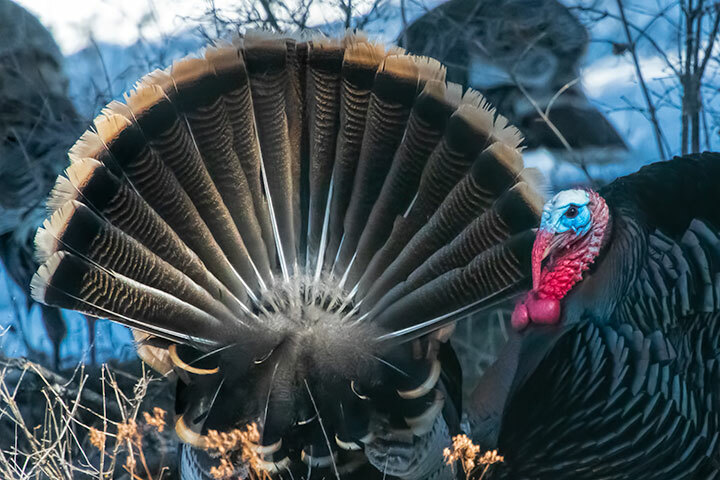 Meanwhile Wild Turkey males are displaying and swallows and bluebirds are arriving. 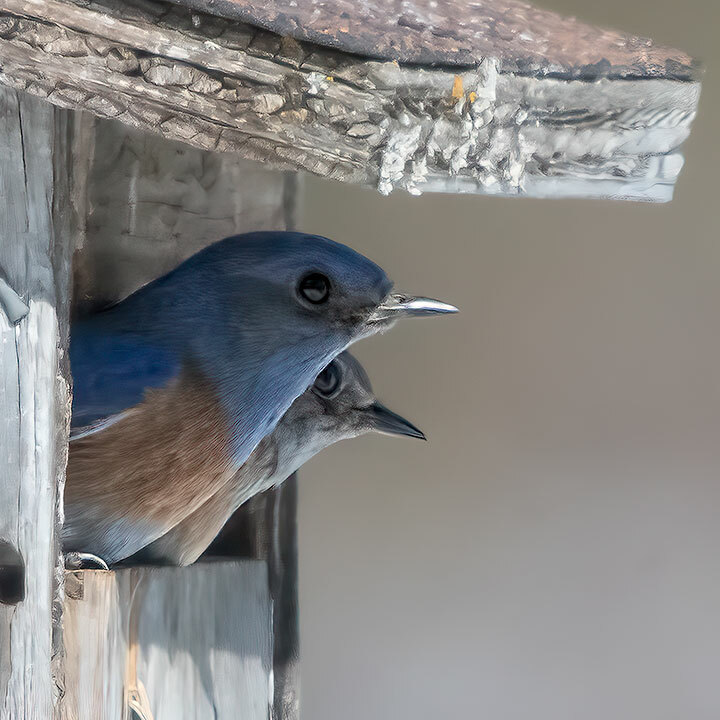 In March, two species of bluebirds arrive: mountain and western. 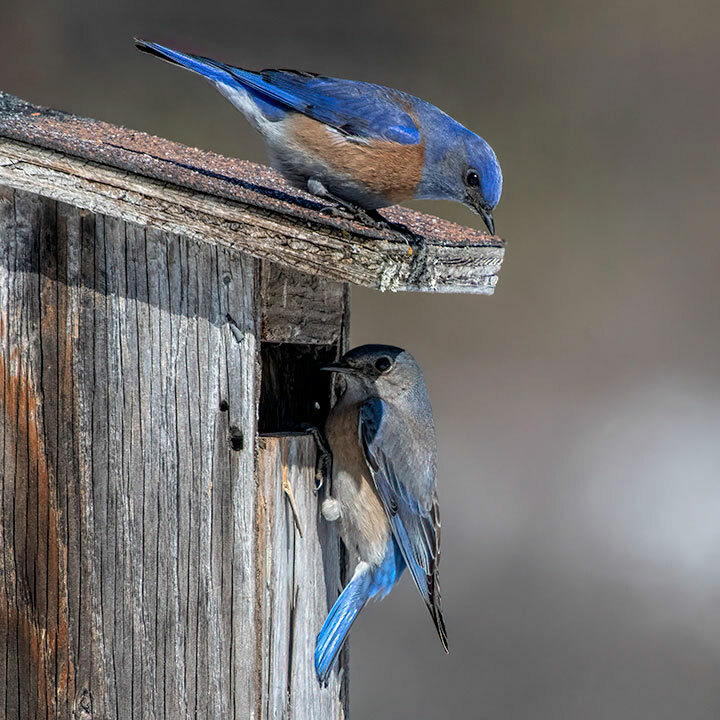 Mountain Bluebirds are the more common and breed throughout the provincial interior. Western Bluebirds only sneak into a small portion of the southern interior. So, it was a bit of a surprise that the first bluebirds seen this year were westerns. 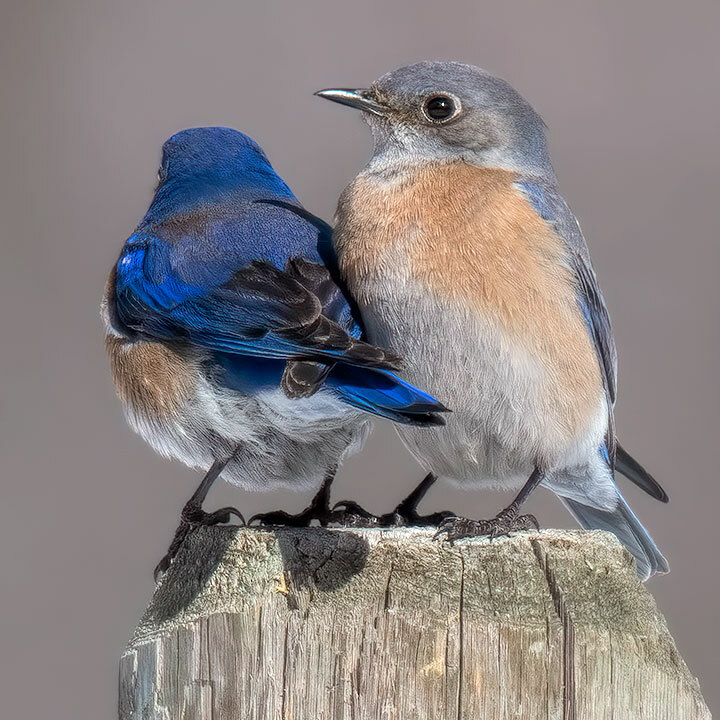 Yesterday, a Western Bluebird couple sat together on a fence post. The male is on the left and the female on the right. The post was within metres of a nest box set up by welcoming locals. From the post, the birds would fly the short distance to the nest box. 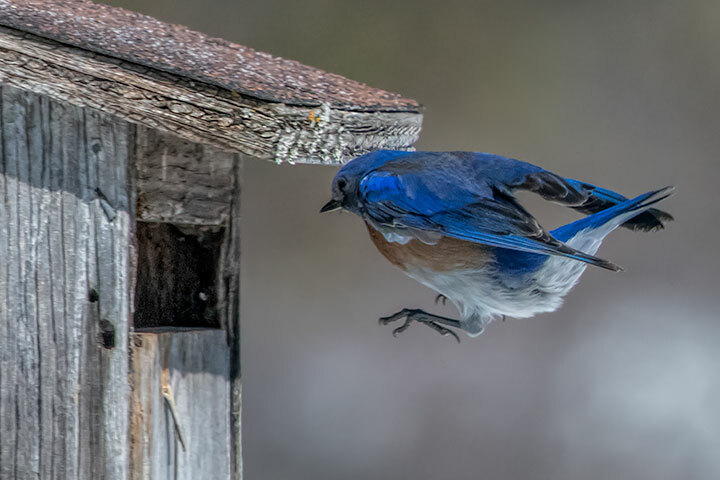 This is standard bluebird practice: alight away from the nest; watch for predators and, when all is clear, fly to the nest. Yesterday, I was asked if I were a birder. Probably not. I rarely look specifically for birds and rarely submit observations to birding sites. So, I probably don’t qualify. What I do do is to look for interesting things in nature. And although what constitutes interesting depends upon experience, it remains that birds are particularly interesting by being some of the most numerous and variable things to be seen during a walk in the woods. I would happily photograph bears and otters (and skunks), but mammals lack the species variability of birds and are less commonly encountered (leaving aside squirrels). Nevertheless, I start with the most common mammal to be seen during a walk. 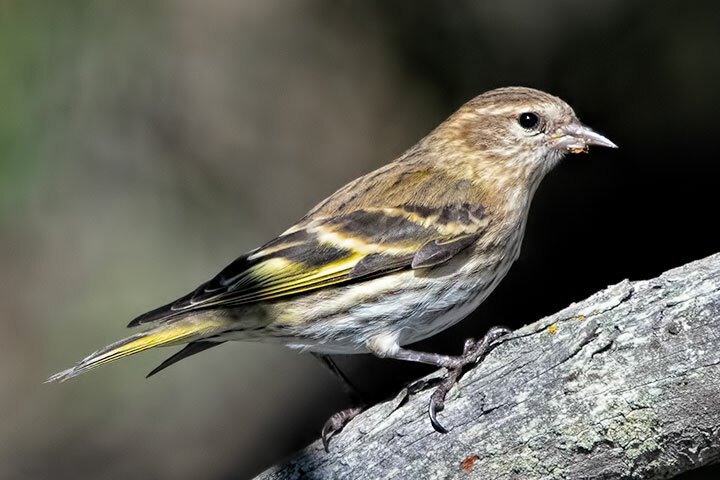 The Pine Siskin is almost as common as the Black-capped Chickadee. Although the dipper doesn’t have a colourful plumage, the bird makes up for it by its colourful behaviour. 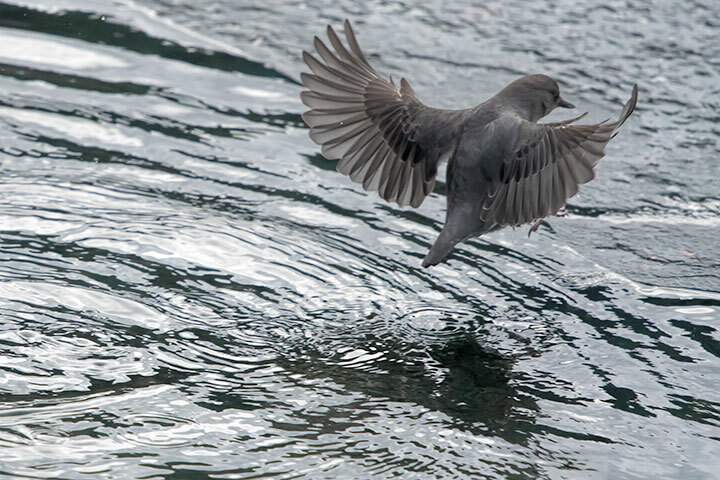 A dipper will frequently just climb out of the creek and onto the shore, yet to get onto this thin border ice, it has chosen to lift off from the water and fly the short distance. 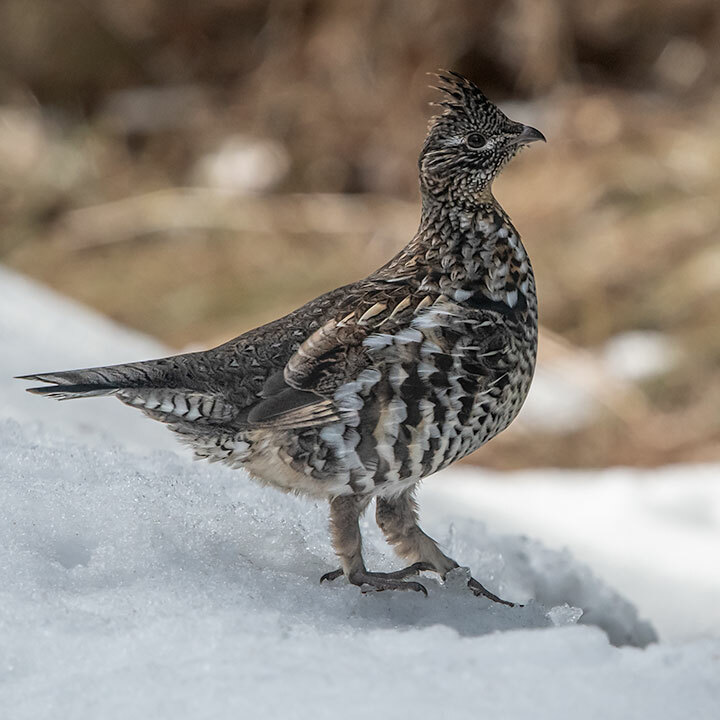 While I occasionally see a Ruffed Grouse in my yard, this one was out in the woods. 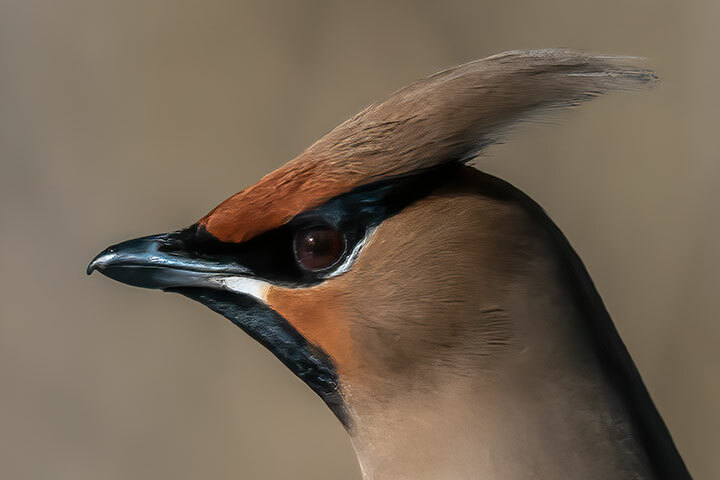 I recently posted a picture of a Bohemian Waxwing flying past, but this one perched nearby and allowed a rather close portrait. Notice the crest. 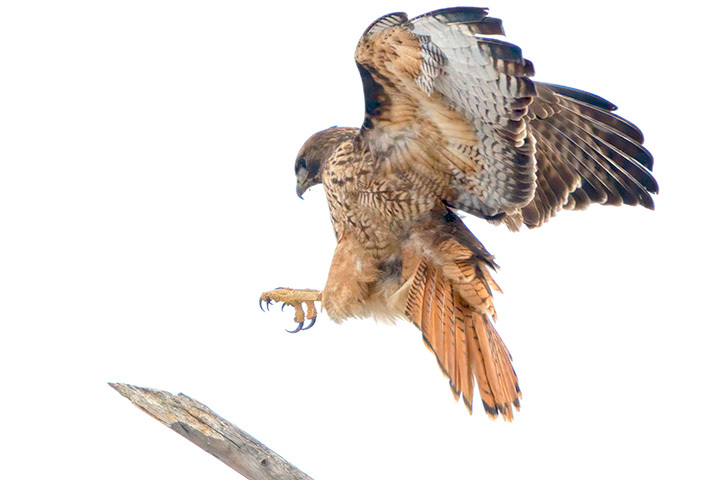 The bird lowers its crest during flight. 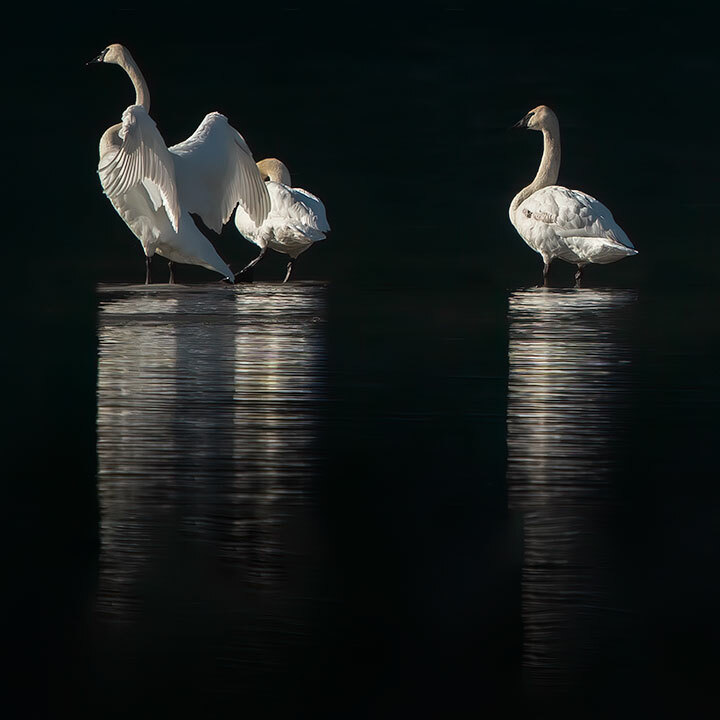 Trumpeter Swans are still with us, but I don’t often see them so beautifully sunlit against a dark background. I was looking for a White-winged Crossbill. It is a somewhat uncommon visitor to the region — and one I had been challenged to find. I did find one, but, one somewhat obscured by branches. 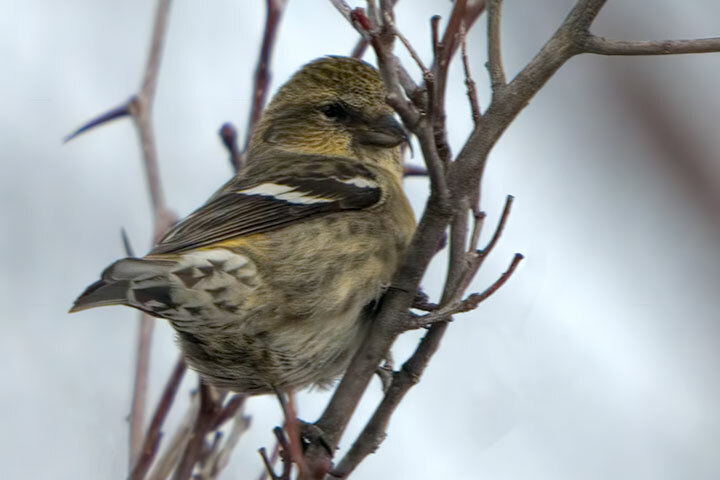 This crossbill doesn’t actually have white wings, but white bars or stripes on otherwise dark wings. Then I encountered something, other than a crossbill, with white stripes on a dark background. Seen first was a White-winged Crossbill sitting in a black hawthorn bush. 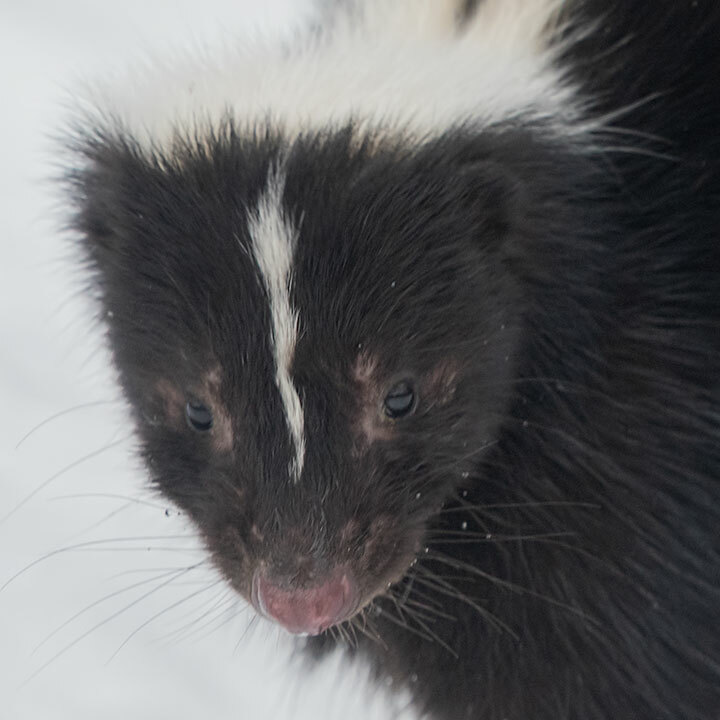 As I watched in trees for white stripes on birds, I glanced at the ground and found I was being watched by something else with white stripes. 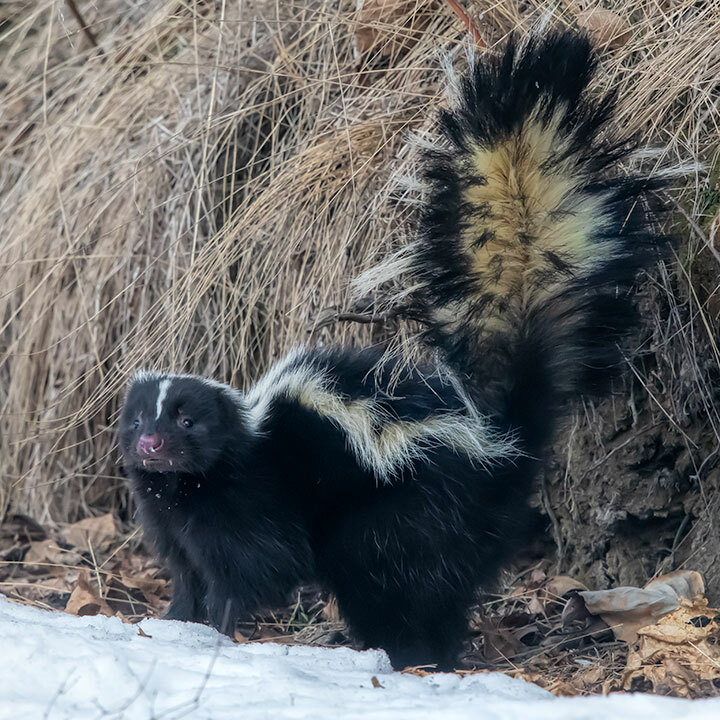 A skunk was eyeing me from only metres away. The arched back and raised tail were a warning to me. 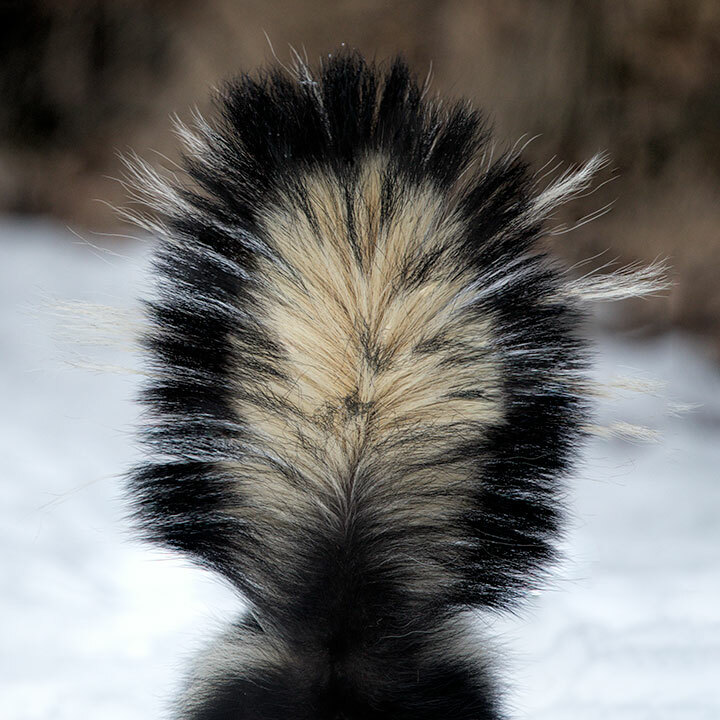 The skunk quickly decided that I posed no threat and merely wandered off. What was this normally nocturnal animal doing out at midday? 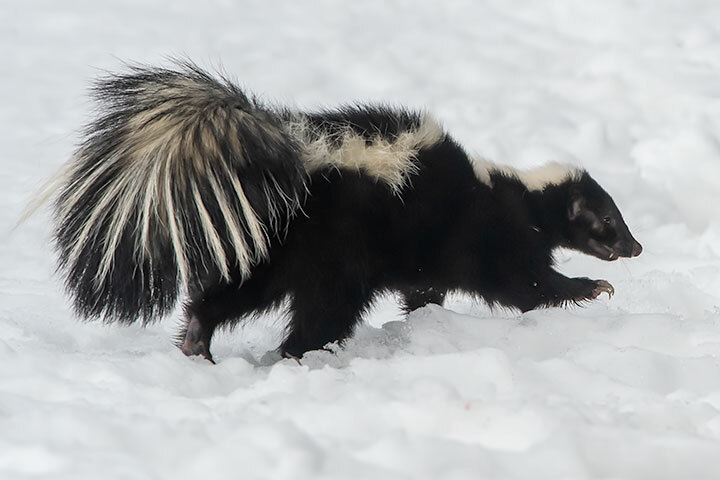 It was probably looking for a mate; this is the skunk’s breeding season. Bohemian Waxwings have been here this winter, but they are not nearly as common as they have been other years. A few flocks were seen, but they remained distant. Finally, some flew close. 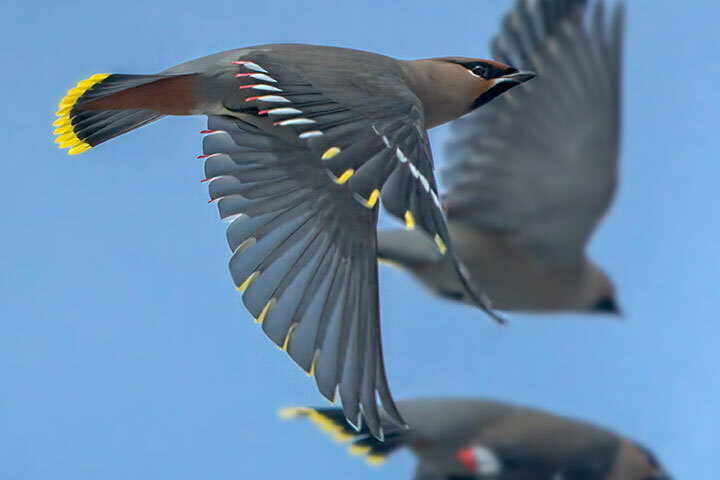 A Bohemian Waxwing flies by showing the red waxy tips to its wing feathers. This is a collection of images that lacked their own postings in February. They are mainly, but not entirely birds. It is interesting that other than squirrels, and deer (that buck has now lost its antlers), I have seen no mammals this month. 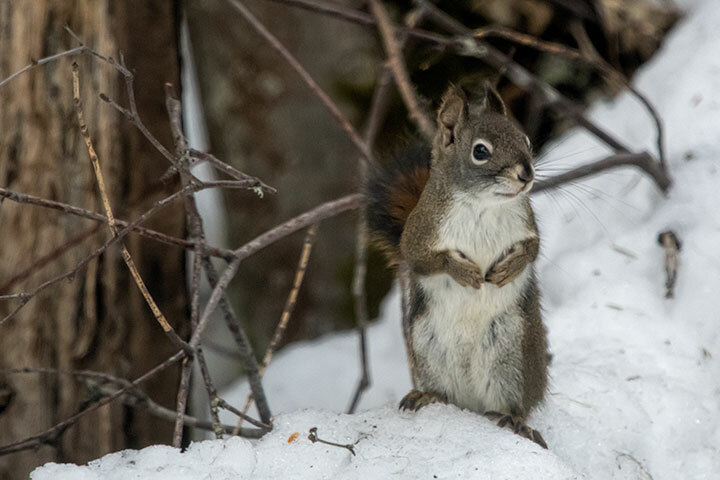 However, there was ample evidence of their presence through their tracks in the snow: squirrels, racoons, mice, voles, hares, and deer. 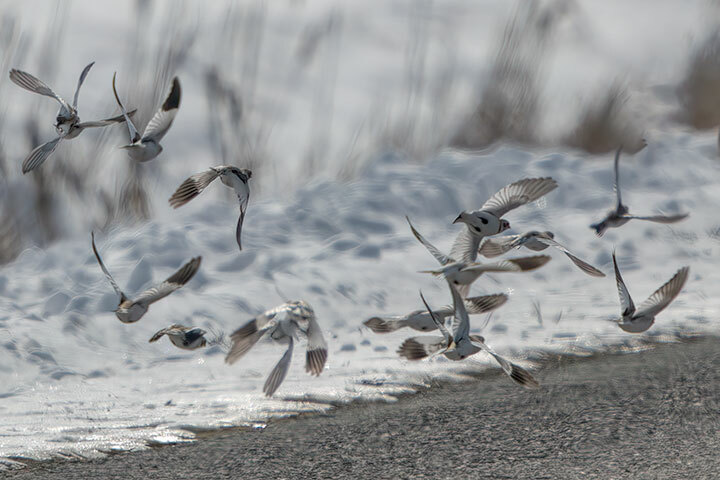 According to ebird (which tracks such things) there are no previous observations of Snow Buntings in Februarys. Here is a flock seen on February 25th. 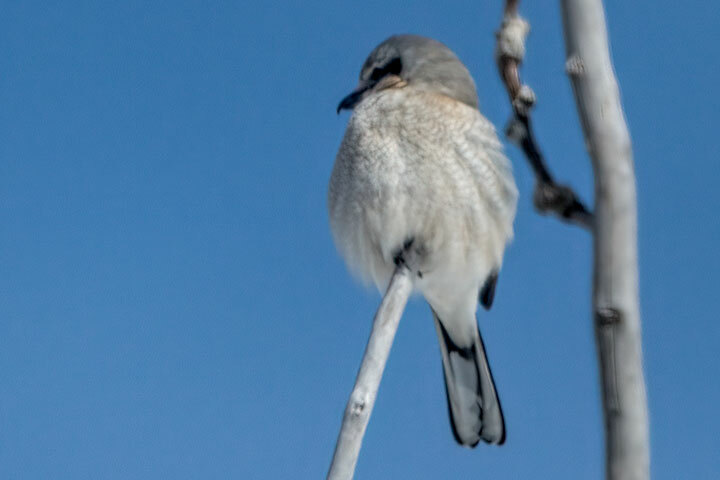 A Northern Shrike was seen hunting. 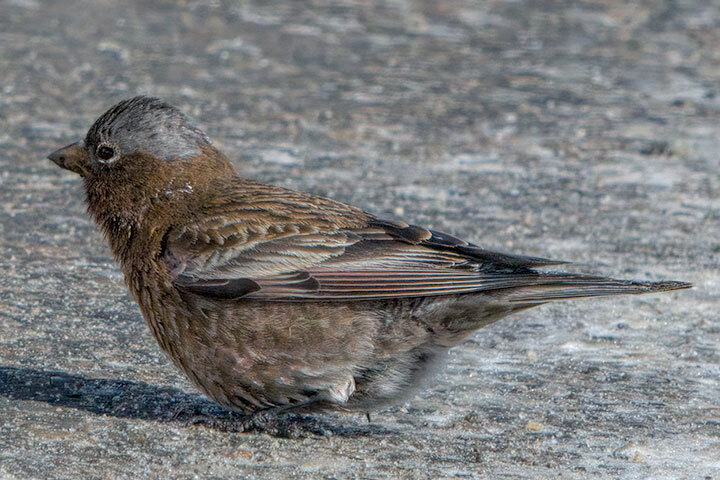 I have only seen Gray-crowned Rosy-Finches once before. 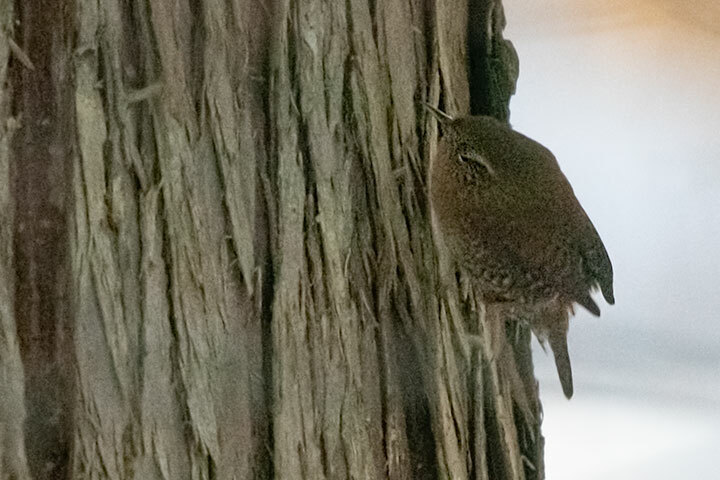 A little more common (but not much so) is the Pacific Wren. In the January goulash, I noted Trumpeter Swans on the West Arm. They were still there on February 23, but had left two days later. The month has been cold and windy. 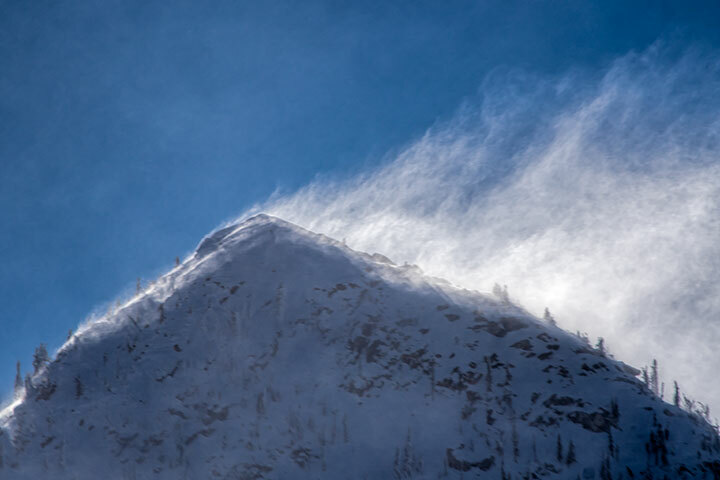 Here is snow blowing off a mountain peak. 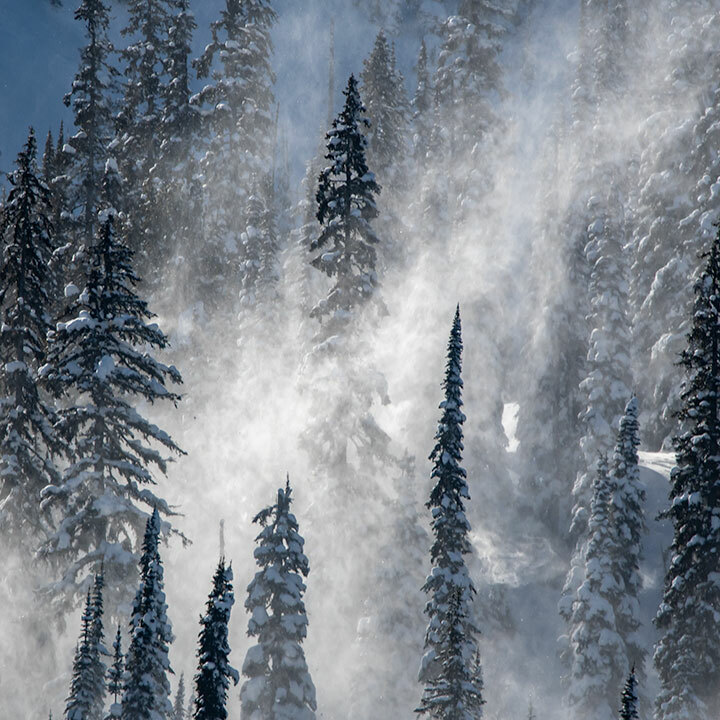 Oh, and did I mention that we have had blowing snow? There are a number of reasons I don’t make use of commercial picture-sharing sites, but one of them is that I like to tell the story of what is going on — often spread over multiple images. Yet, now and then, a picture just stands on its own. 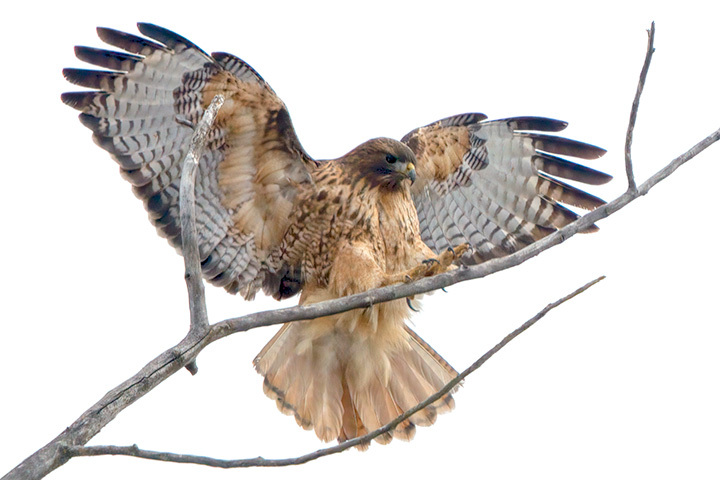 Such was the case with yesterday’s Red-tailed Hawk alighting on a tree branch. 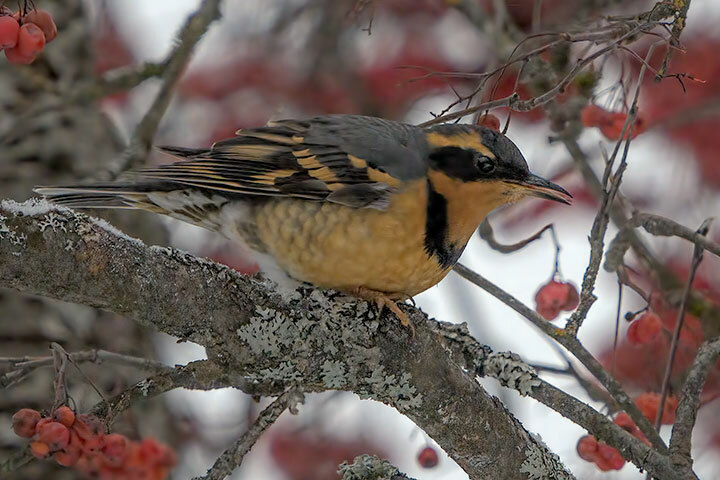 There has been a slight uptick in recent observations of the Varied Thrush around the region. This orange-coloured cousin of the robin (also a thrush) is a permanent, but sparse, resident of the region. In the winter, a few more of them can be seen as others migrate through the region. I have recently spotted the Varied Thrush in a few places, but principally hanging around the rowan trees, where it seems to like both berries and the insects it finds there. Unlike the robin, this thrush is remarkably skittish: if it realizes that you are watching, it is abruptly gone. However, the real reason for this posting is that I managed a picture showing it flying. I discovered that in all of my previous images, it is perched. 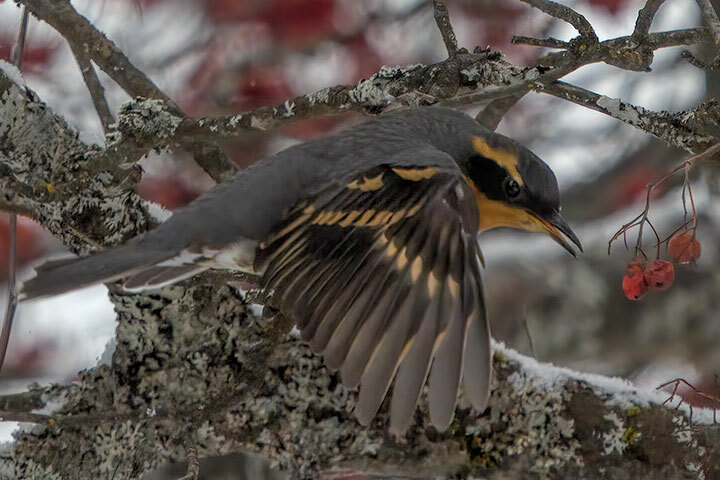 Indeed, the vast majority of the online images also show it perched — it seems that it is difficult to take a shot of the Varied Thrush flying. A male Varied Thrush forages in a rowan tree. It then flew to a different location, and in doing so, spread its orange wingbars.